Fitness training refers to exercise that improves overall health, facilitates weight loss and strengthens the body as a whole. Rather than building muscle or toning the body in order to be suited to a particular sport, fitness training focuses on appearance, confidence and wellbeing. Exercise plays a huge part in fitness training, but other components like diet and routine are incredibly important if you want to see results. At Velca Health Centre, fitness and strength training are two important aspects of the personal fitness programs that we offer our clients. Massage therapy and chiropractic care are key in our holistic approach to health and help our clients free themselves from pain, but fitness training and a change in lifestyle is often crucial in creating permanent and lasting relief. Why Do I Need Fitness Training? Clients come to us with all sorts of aches and pains that prevent them from living life the way they want. Repetitive injuries, back pain, knee pain and joint pain can be incredibly inhibiting – but nothing is more inhibiting than an unhealthy lifestyle. Fitness training not only helps to prevent pain from recurring by strengthening the body and improving the cardiovascular system;it also helps you to get healthy and stay healthy by promoting positive changes. General fitness is an important part of injury rehabilitation and recovery. 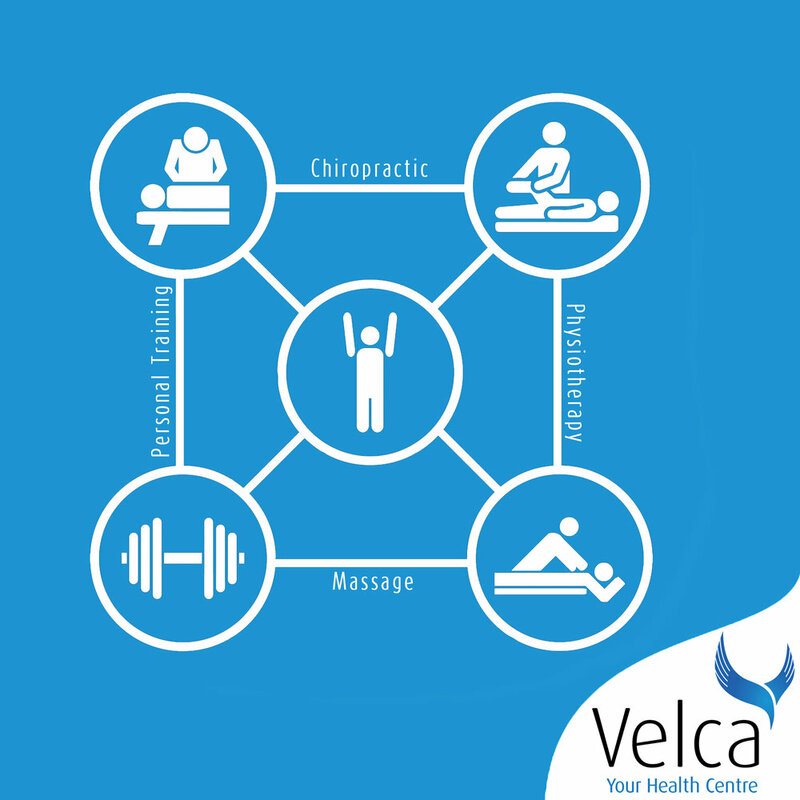 Chiropractic care and/or Massage therapy is often only the beginning of restoring motion and function – a personal trainer at Velca can work with you on preventing an injury from returning and making your body stronger and more resilient than ever before. Focus, determination and a balance in your life between fitness and nutrition can greatly contribute to successful weight loss. Knowing how to set goals and improve your level of fitness is the most important part of getting the body you’ve always wanted. The stronger your body is, the more injury-resilient it will be. Chiropractic and massage therapy can help relieve pain, but preventing its return means working on the affected areas. A higher level of fitness can ward off back pain, neck pain, joint pain and knee pain, letting you lead the lifestyle that you want without having to grit your teeth or limit your movements. Is Fitness Training Going to Help Me? Fitness training can help almost anyone. Our personal trainers, at Velca Health Centre in Auckland, can work with you on setting and achieving your goals in weight loss and fitness as part of our unique Velca Method and our holistic approach to health. Break free from pain; enjoy a permanent solution at Velca Health Centre and a higher level of fitness with fitness training. You’ll feel stronger, more confident and ready to take on all of life’s challenges.